The PowerTap complements any desk from the most luxurious to the very basic. Its smart design allows for easy access and quick storage. Simply slide the latch to reveal a multi-port power Center. When finished, slide the latch and it rotates out of sight under a sleek black cover. 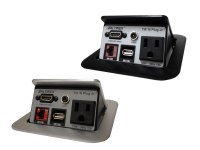 Install multiple PowerTaps on tables and counters where more workstations are necessary. 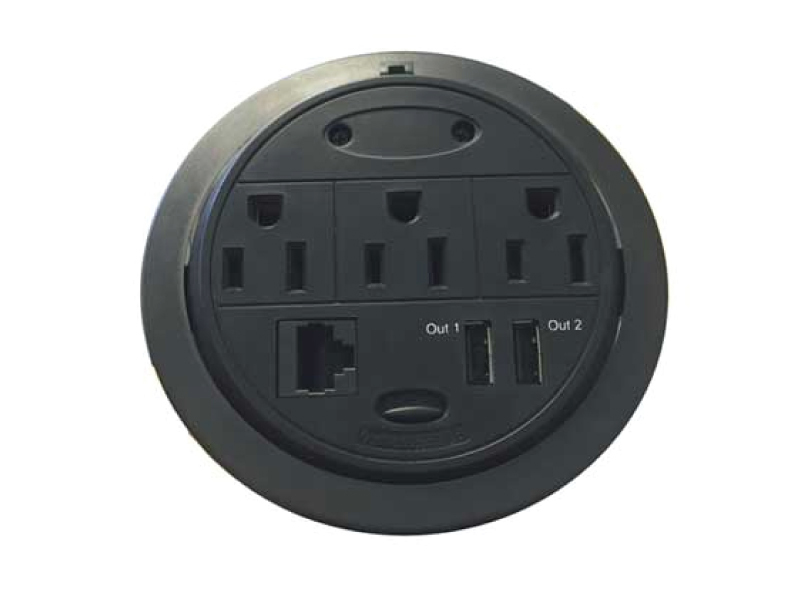 Perfect for conference rooms, the Grommet allows easy access to a secure internet connection along with a power source. Accessing More Power at the Office Couldn’t Be Easier! 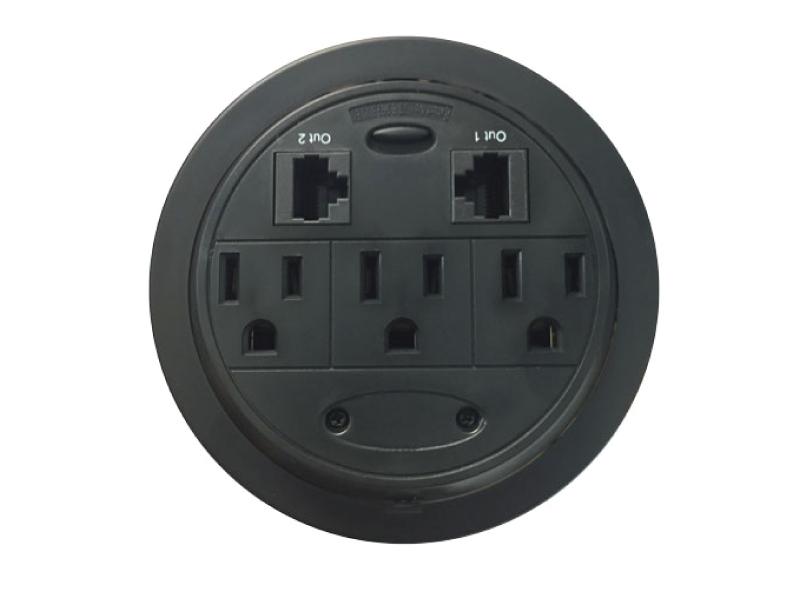 CableTiesAndMore brings you the Powertap and Data Grommet with Kable Kontrol. The Powertap and Data Grommet can be easily installed with few tools in a short amount of time to any desk at the office. 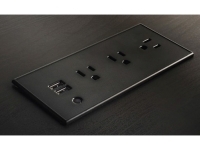 Once installed, the Powertap and Data Grommet allows users to have access to more power as well as internet and USB connectivity as the main power source of the Powertap and Data Grommet is through a power cable which connects to an external power outlet. The installation process of the Powertap and Data Grommet can be completed in just four easy steps! The four easy steps are described further in this description. For now, let us take a look at the features and benefits of using the Powertap and Data Grommet at the office, starting with the features. 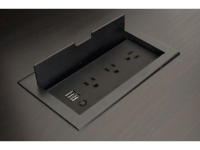 The Powertap and Data Grommet allows for easy access to power and the internet via Ethernet connections practically anywhere within the office. In addition to the access of power, the tap also features USB connections. Another amazing feature of the Powertap and Data Grommet is how discreet it is on a work desk as it has a height of only 1.25 inches. An additional spectacular feature of the Powertap and Data Grommet is the 180 degree functionality which will be further discussed below within the benefits section. We will now look at the benefits that are associated with the Powertap and Data Grommet’s amazing features. Since the Powertap and Data Grommet allows for easy access to power and internet, the main benefit of this feature is to create more work spaces in the office, thus creating potentially higher productivity as more desktop computers can be set up at these once less functional desks. The Powertap and Data Grommet also benefits mobile friendly users as mentioned, the power tap features USB connectivity. 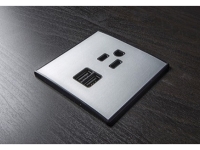 This would allow for employees to charge their mobile devices easily throughout the course of a conference meeting without stretching or fraying the charging cables that are provided with their devices. 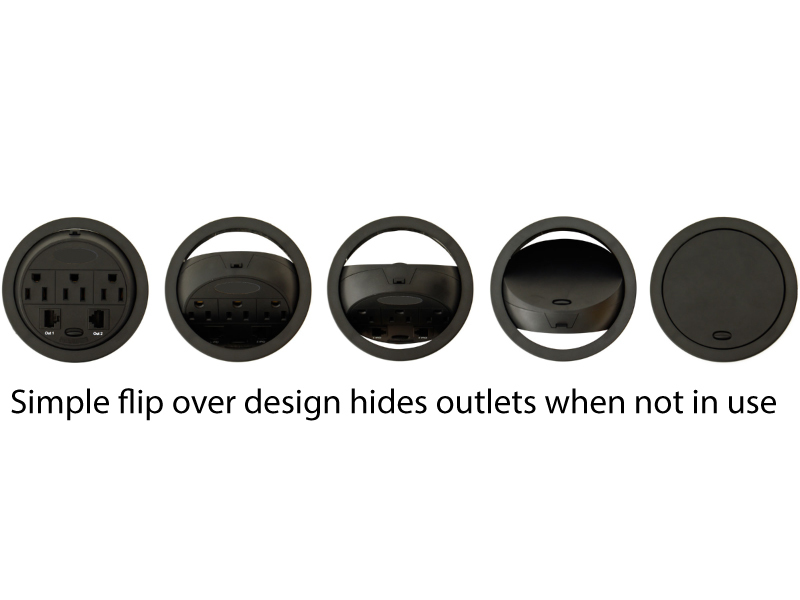 The benefit of the discreetness of the Powertap and Data Grommet allows for more workspace on the office desk as it is only 1.25 inches in height with a diameter 4.44 inches, housing up to three power outlets, and either Ethernet or USB adapters. installation process, we will briefly look at more specifications which the Powertap and Data Grommet acquires. The Powertap and Data Grommet can be used and installed on many office desk materials such as wood, plastic, and machinable metals just to name a few. 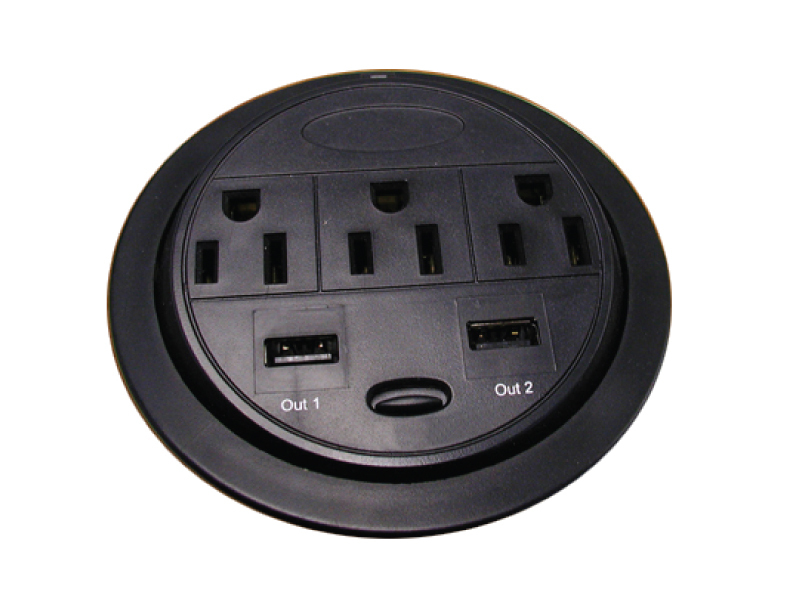 The Powertap and Data Grommet is supplied with an 8 foot power cord that will easily reach most power outlets within the office work area. 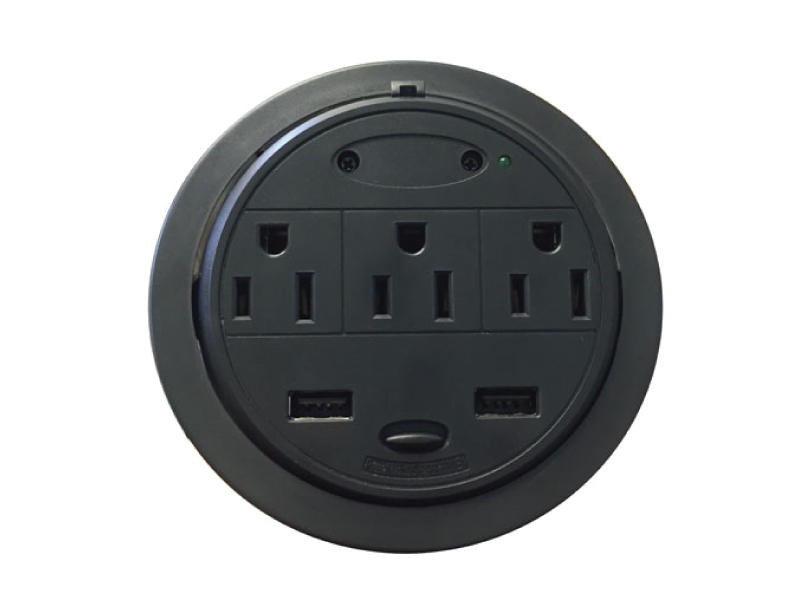 Attached to the 8 foot power cord are three power grounds along with your choice of additional Ethernet or USB connections per grommet. This allows for a much more productive and efficient work space. The Powertap and Data Grommet comes with safety in mind as it is manufactured with ABS plastic, which is fully UL/CUL listed and fully fire retardant. Now, we will discover the easy installation process of the Powertap and Data Grommet. The Installation Process in Just Four Easy Steps! Yes, you read that correctly! The four easy steps for the installation of the Powertap and Data Grommet are described in a simplified format as seen below. First, you will need only two tools which are table clamps and a jigsaw or electric router. Once you have collected the tools needed to complete the simple installation process, you will need to determine where you will want to place the grommet on the table top. Once you have decided the placement of the grommet, you can begin to trace the perfect diameter of the cutout by using the template provided with the Powertap and Data Grommet product. Secondly, once the template has been traced, drill a hole into the center of the tracing large enough to allow for the blade of the jigsaw or router to start cutting. Thirdly, once the hole is cut, feed the cables through the hole and seat the grommet. Finally, once the grommet is in place, begin to connect the power supply cable to an external power outlet. Also, connect Ethernet cables to allow for internet connection if option is available on the specific model purchased. Now, the Powertap and Data Grommet is ready for use! and Data Grommet by CablesTiesandMore will make any work office more efficient and productive as it can be easily installed on any office desk. Does this unit have pass through power to the ethernet ports? There is no power pass through from the ethernet ports.